The monarch butterfly, which is one of North America’s most recognizable and visually arresting creatures, has been depleting in numbers as of late, prompting numerous writers, scientists, and environmentalists to call for legislative protection for the butterflies. Thousands of monarch butterflies huddle closely together during their annual migration to Mexico, and though the insects once covered over 44 acres of land during this excursion in 1996, today the butterflies cover only 1.65 acres, the smallest portion of land since measurements began in 1993. Several factors have been blamed for the stark decrease of monarch populations in North America. Extreme weather is one possible culprit, while illegal logging of trees in the natural Mexican habitat of the butterflies may also play a role in their decline. Lastly, genetic modification of crops in the U.S. has caused the displacement of milkweed, which the insects rely on for sustenance. Because of these phenomena, the monarch is steadily approaching “endangered species” status. Intellectuals ranging from Canadian author Margaret Atwood to U.S. environmentalist Robert Kennedy Jr. have banded together and drawn up a petition to Barack Obama, Mexican President Enrique Pena Nieto, and Canadian Prime Minister Stephen Harper. 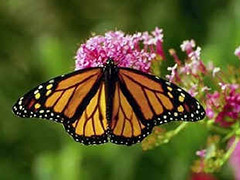 The petition, which was curated by Mexican environmentalist HomeroAridjis, urges them to develop protective legislation for monarch butterflies by addressing the agricultural policies that have lead to the decline of the colorful insects. The three leaders met near Mexico City on Wednesday, February 19th, where they were expected to be presented with the petition. Posted on February 26th under Global Ecology.